We all love cats, but now's your chance to be one. Okay, okay, so not really, it's just that Halloween is right around the corner, and you can use this costume opportunity to dress up as one of your beloved felines. And then you'll be a cat yourself! So, what are you feeling? A little bit of Meow? Or a whole lotta Rawr? We're sure suiting up in a cat costume will be a whole lotta fun, whether you're a docile house cat or even a ferocious jungle predator. Maybe you've even just got a cat accessory kit for dress-up day at work, and that's perfectly a-okay, too. There's just one important thing we're going to want to take care of. You're going to need to get a kitty nose and whiskers on your face. Well, we have a makeup kit for that! 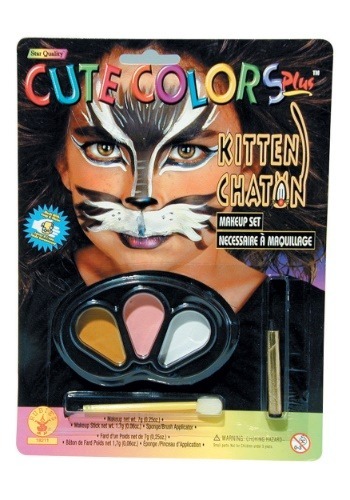 This Cat Makeup Set is from the Cute Colors Plus series and is ready to complete your cat costume. It comes with 3 colors in the makeup palette, along with a black stick and applicator. When you're ready for all the meows and rawrs you can create, just get your whiskers on and you'll be ready for fun!